When more details of the crossover were announced this year, one of the things that the people involved announced was that they were scaling back the size because there were too many characters. They’d focus on the core three in Barry, Kara, and Oliver as they fought alongside Superman and Batwoman. And while I thought the crossovers had certainly become harder to manage because they get bigger and bigger every year, the idea that the problem is the stars of the shows not getting enough focus is a little hard to swallow. Rather the problem is that even with the crossovers getting bigger, we still always manage to focus everything on Oliver, who has managed to swallow two crossovers whole with his relationship issues. James-X, we hardly knew ye. Take James Olsen, for example. Quite apart from the absolutely abysmal mistreatment he got on his own show when the Supergirl writers decided that the white guy would be better for Kara, consider the fact that he, too, was left out of the journalism conversation in this crossover. Or that, despite the fact that until Clark and Lois turned up, he was one of the three journalists in the Arrowverse, he and Iris haven’t actually talked about it. 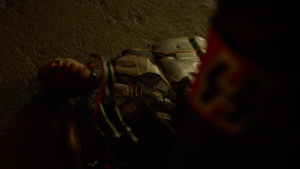 In fact, James has only crossed over once – in Crisis on Earth-X, where he got a few seconds of screentime in the very beginning and then was killed by Nazis. Speaking of Crisis on Earth-X, let’s sit with that for a minute. Because it would almost be comical just how many people of colour that Guggenheim and Kreisberg, who wrote the story for that crossover, managed to sideline or simply run out of “space” for. In his very first crossover appearance, James lasted a couple of minutes at most before he got knocked out. Wally West, despite coming for his sister’s wedding, was tasked with “looking after Joe and Cecile,” effectively taking the other two Black people into Offscreenville too. Cisco Ramon, who is often used when people want to deflect from their racism, was knocked out for a full episode for reasons. Amaya and Zari made cameos in the Legends part. The only Black character who got to say something substantial about being Black and surrounded by Nazis was Jax. I think. Or perhaps we should talk about the fact that, for all of the diverse characters that exist on the shows, barely any of them get to interact? Joe West (Jesse L. Williams) and John Diggle (David Ramsey) have been in the same universe for five years, but they have never spoken. Amaya has never spoken to Iris. In fact, the only time two Black characters have ever had substantial interaction is when J’onn J’onzz (David Harewood) visited The Flash and got to hang out with Wally, after five years of crossovers. If it weren’t enough that social issues only remain on Supergirl and Legends of Tomorrow, despite the fact that most of the cast of The Flash are people of colour, the people of colour don’t interact in any meaningful way, which reinforces the notion that they are, in fact, merely there for diversity brownie points. 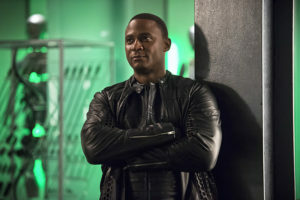 As the one Black character who has crossed over almost every year, Diggle is pretty much the Token Black Guy of the Arrowverse. Furthermore, #ElseworldsSoWhite exists in a context where these people of colour are routinely ignored even while their creators are praising themselves for how diverse they’re being – even on their own shows. We’ve talked about James’ treatment, but what about the fact that Cisco Ramon is usually the designated babysitter for the white characters on his show, often at the expense of his own storyline? Or the fact that Wally West was booted off the show, and not only did his replacement get the story arc and support that people insisted there wasn’t “space” for before, but he engulfed the plot and ruined the tone of the show with his obnoxious “humour”? Or that Supergirl has been so abysmal when it comes to women of colour than none have ever made it to series regular status, let alone to a crossover? #ElseworldsSoWhite, despite what detractors may think, was never just about Iris. When you consider the implications behind how the people of colour have been treated in the Arrowverse since it started, it becomes much more than that. And it is rather irritating that people think otherwise. Absolutely fantastic article and well worth the wait. Thank you for writing it. Absolutely needed to be said, great article! That excuse was obviously because Keiynan Lonsdale wanted time off and they couldn’t come up with a better excuse. You once again so eloquently stated the whole truth and nothing but the truth sis. It’s gotten so blatant that the Arrowverse showrunners at large don’t see Iris as important as she should be via the comics that I even saw some people impartial to her say it didn’t make sense for her to crossover, not only because she’s Barry’s wife but the leader of Team Flash and most of the action took place in Central City. I can’t help but wonder if hashtags would be necessary if Iris was portrayed by a white actress. But I think we all know the answer to that one. Also, lol at the buffoons listing all the other POCs not included to counter the hashtag thus proving our point. I don’t really know what to say at this point. I like the idea of crossovers, but I’ve always hated these ones because they’re not inclusive at all. It’s just one long ego stroke for Oliver and sometimes Barry. Right? How stupid can you get? I love this so much Ivy. The only cross-over event that I’ve been excited about was Crisis on Earth X, even as problematic as that was. After the first part of this year’s cross-over, I barely watched the rest, because I knew that it was about to be some BS that would just make me mad. I love Barry, and at one time I used to love Oliver, but the amount of screen time they got in comparison to Kara just got on my nerves. The fact that once again Guggenheim and his band of misogynistic aholes didn’t see fit to include Iris, when we had a new character in Lois Lane that literally had ALL the damned arcs made me mad af. And I’m somebody who LOVES Lois Lane. Love. Her. She has been one of my favourite comic book humans for decades, but I was still mad that she got so much screen time over an established character like Iris. One of the things that was also glaring was how much Superman got to do on Supergirl’s episode. But I guess that’s par for the course over there with Kara being sidelined for any white man within a 200 mile radius. Anyway, it was a fantastic read, thanks. I liked the Flash part of the first one, hated the second, and the parts of the third with Barry and Kara. Loved the fourth until the end. Seeing as I hate Oliver, crossovers are very hard for me. Guggenheim is just unspeakably bad. There are no other words. The fact that men routinely get more to do in the Supergirl episodes just says it all. Thanks for your work, Ivy. It gives a detailed, eloquent, and evidence-based voice to the issues that seem intractable in the Arrowverse. Hopefully, Eric Wallace and the ending of “Arrow” will help with some of these problems.